The largest animals in the Ordovician oceans were the shell-bearing, squid-like cephalopods. They are called orthoceratites and many fossils of them have been found. You can see smaller versions in the diorama. Most orthoceratite had long, straight shells with many gas-filled chambers. Others had spiral-shaped shells. They included both small species only a few centimetres long and enormous species that could be up to eight metres in length. We believe that they were predators and the top consumers in their ecosystems, like the great sharks of the present day. An orthoceratite, squid-like cephalopod with external shell from the Ordovician. Fossils of orthoceratites are often found in the stone floors of stairwells,railway stations, museums – you can find several here in the museum’s entry hall and stairways. You can also find fossils of other animals such as trilobites and snails. That is because the museum floors and stairways are laid with Ordovician limestone, a very common material in older Swedish buildings. Most of the limestone is from the Baltic island of Öland and was formed on an ocean floor some 450 million years ago. 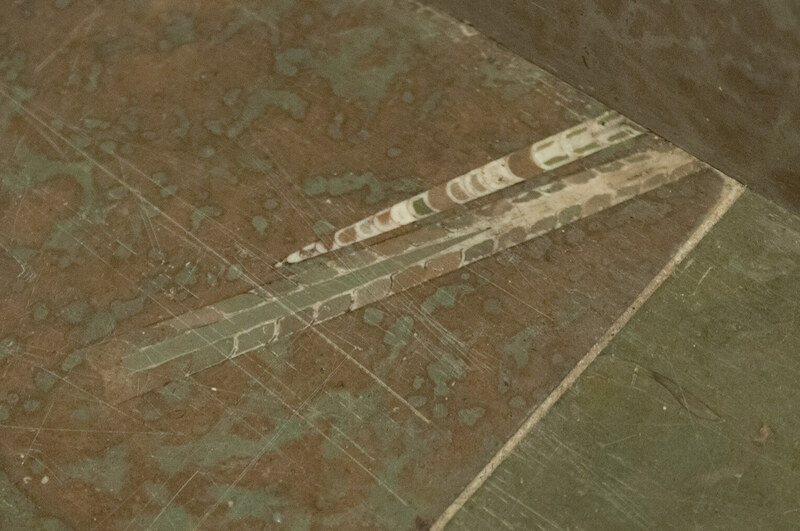 Fossil cephalopods in the museum stairways. 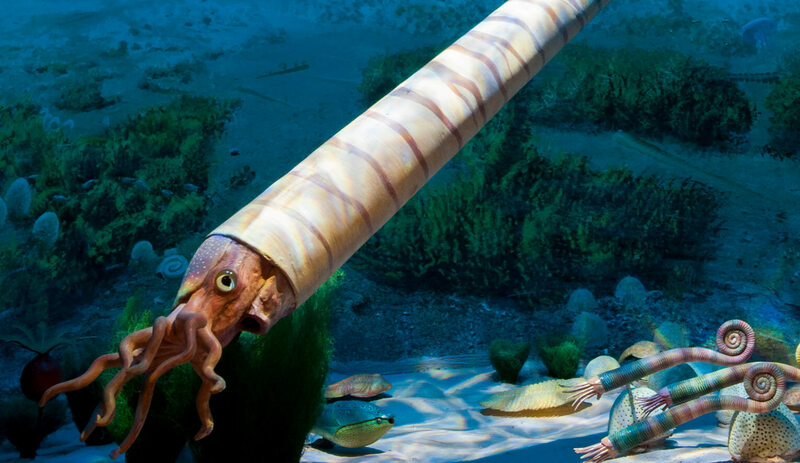 Scientists believe that orthoceratites swam backwards, like today’s squids and cuttlefish. They may have lived on or near the ocean floor with their awkward shells facing upward. If so, they could have used their arms to move about. The shell had flotation chambers, and on the fossil in the display case you can see how the shell was built up of many chambers. When the animal was alive, the chambers were partly filled with gas which provided buoyancy and balance. 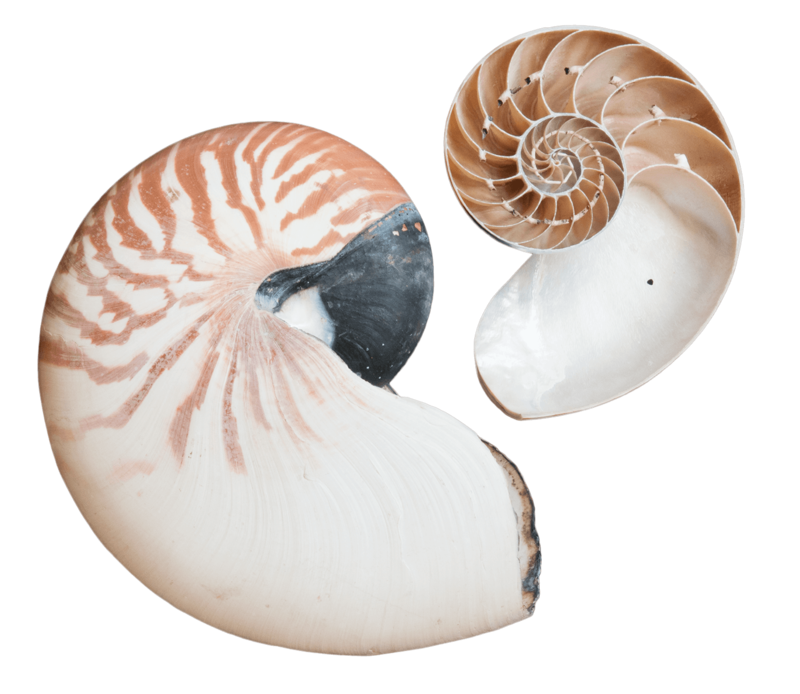 The same type of construction is found in nautilus species, the only modern cephalopods with external shells. Shell of nautilus, the only modern cephalopod with an external shell.